EDINBURG, TEXAS – NOV. 4, 2015 – The Office for Sustainability at The University of Texas Rio Grande Valley is looking at the possibility of bringing its award-winning tree care practices to the community. UTRGV is one of three universities selected as a finalist in the Tree Campus USA Service Learning Contest by an internal judging committee from the Arbor Day Foundation, a nonprofit conservation and education organization. Voting to select the winning campus begins Nov. 9 and ends Nov. 13. The public is encouraged to vote once a day by visiting www.arborday.org/vote. The winning school will receive $10,000 and Tree Campus USA swag to create a service learning project that engages its students in a tree planting or maintenance project in a low- to moderate-income area of the community. The other contenders in the large-school category are the University of Alabama, Birmingham, and the University of Pennsylvania. The contest follows the UTRGV Edinburg Campus’s recent designation from the Arbor Day Foundation as a 2014 Tree Campus USA university for meeting five core standards of tree care and community engagement – including creation of a campus tree-care plan and a service-learning project. Tree Campus USA is a national program created in 2008 by the Arbor Day Foundation and sponsored by Toyota. If awarded, the Office for Sustainability will provide each resident of the Lynchburg Neighborhood of Edcouch with a tree, a tree care kit, and bilingual training at a workshop to foster a beautiful, livable community. An additional three trees will be planted inside the upcoming community center area, which includes a playground. The project would be a collaborative effort with Proyecto Azteca, a local, nonprofit, self-help housing program. Proyecto Azteca placed 32 families from the colonias and housing authorities into energy-efficient, affordable homes they helped build in 34 lots purchased in the Lynchburg Subdivision. The subdivision is the first silver LEED-certified neighborhood in South Texas. LEED, or Leadership in Energy and Environmental Design, is a green building certification program that recognizes best-in-class building strategies and practices. The service learning project would provide students with hands-on learning on environmental issues, maintaining tree health, and working with diverse community values, said Marianella Franklin, UTRGV’s chief sustainability officer. Additionally the trees would add energy efficiency, aesthetic appeal, and increase the economic value of the houses in the neighborhood. The winner will be announced the week of Nov. 16. 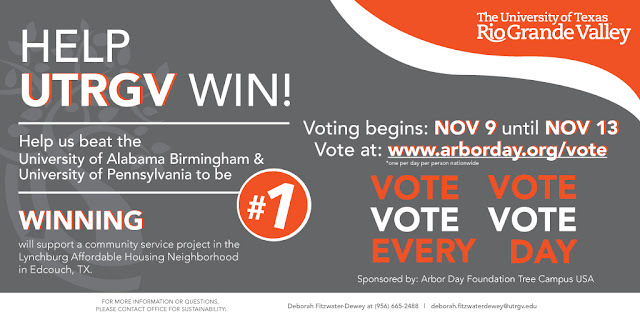 Vote for UTRGV Nov. 9-13 by visiting www.arborday.org/vote. For more information on UTRGV’s Office for Sustainability like its Facebook page.